Firefighters have begun the task of investigating the cause of yesterday’s blaze. He has been named locally as Grant Elder, 73, who lived alone. 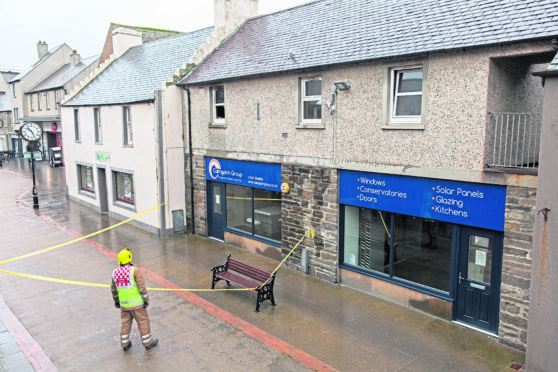 Emergency services were called at around 7.20am to a fire at 7 Bank Street, above the shop Cairngorm Windows. Thurso Councillor Donnie Mackay lives nearby. He said: “I saw the blue lights this morning. I didn’t know until I reached Scrabster that it was Grant Elder. “It is very sad. My heart goes out to the family. “He hasn’t been keeping well this last wee while. His nephew Donald MacIntosh, his sister’s son, was going in to visit him every day. “Grant used to sit with us at the Fisherman’s Mission in Scrabster for a cup of tea in the mornings. But he hadn’t been coming along recently. It his understood that Mr Elder worked as a lorry driver before he retired. Rab Middlemiss, fire service local senior officer for the Highlands, said: “The Scottish Fire and Rescue Service was alerted at 7.16am on Thursday February 7 to reports of a dwelling fire in Thurso. “Operations Control mobilised three fire engines to Bank Street, where firefighters extinguished the fire. “Sadly a man was found to have passed away at the scene, and our thoughts are with those affected at this time. Police said that he is yet to be formally identified but his next of kin are aware. Detective Inspector Scott Macdonald said: “First and foremost, our thoughts are with the man’s family and friends at this time. The flat, which could be seen to be badly damaged following the fire, is situated above the pedestrian area in the town centre. The roof was still intact, however there were a number of broken windows and the porch looked particularly badly damaged. The area was taped off and there was still a police and fire service presence yesterday as the investigation got under way.